Carta is a software platform for founders, investors, and employees to manage equity and ownership. Carta helps companies and investors manage their cap tables, valuations, portfolio investments, and equity plans. Carta’s goal is to map and expand the global ownership network in order to increase liquidity and transparency between shareholders. 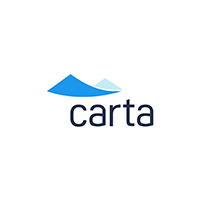 Founded in 2012, Carta has raised $147.8 million from Meritech, Tribe Capital, Union Square Ventures, Spark Capital, and Menlo Ventures, and is an SEC-registered transfer agent.